Well it's that time again, for another new challenge over at Penny's Paper Crafty - and this time it is 'Anything Goes' - how easy is that. So there are lots of great prizes up for grabs. 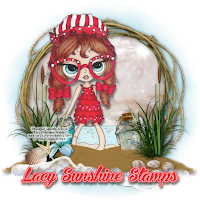 I was lucky enough to be given a Lacy Sunshine image to play with. I thought this was so sweet and just a joy to colour. Gorgeous card, I love the embossed background, makes for a really lovely card. Hi Sharon, Beautiful card and so fresh in the lemons and whites. Perfect card with all the layers for our Layers Challenge at That Craft Place. Good Luck and hope to see you again soon.